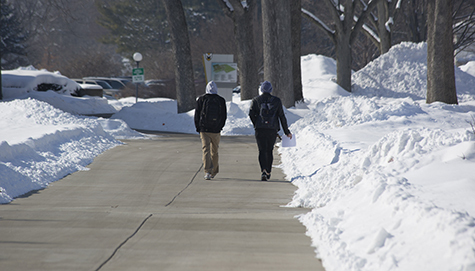 We are cancelling classes today, Feb. 2, at the North Manchester campus due to cold and blowing and drifting snow throughout the night. The Fort Wayne campus is on a two-hour delay. The Jo Young Switzer Center and Library are open. Dining: Haist Commons (regular service hours) 7-9 a.m. breakfast, 11-1 p.m. lunch, 5-7 p.m. dinner; The Oaks is open through 7 p.m. today; The Sisters Café will open 4 p.m. through 9 p.m. tonight; and Wilbur’s is closed today. It is scheduled to open Tuesday. Kenapoc will not meet Monday night. The University has also notified area media and they will also post updates as needed. Student-athletes should check with their coaches about games and practices. Because Manchester University is a residential campus in North Manchester, a number of employees are necessary to support our students. Staff members who live close and are able to travel safely to campus will be greatly appreciated. Staff for maintenance, grounds, switchboard and safety are considered "critical" to the safety of our students. Employees must make their own decisions whether they can safely travel to their jobs. The MU Employee Handbook includes Manchester's pay policy for emergencies such as this.